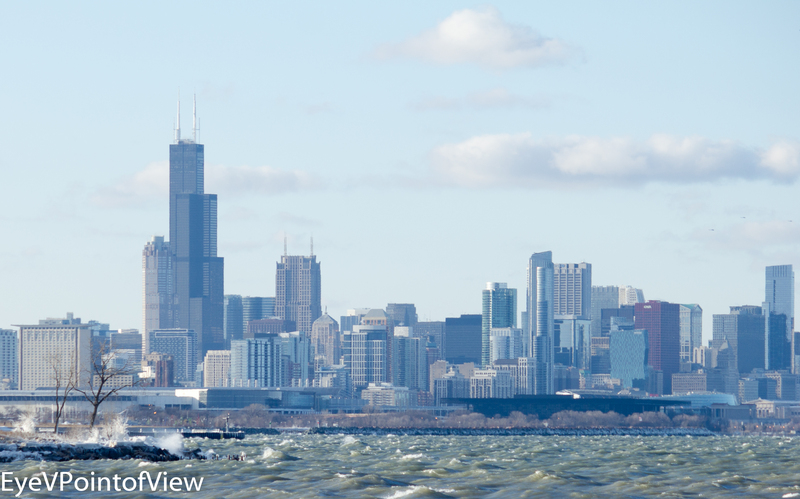 Two weeks ago, winter was still here in Chicago, in all its glory. We started the week out with weather temperature in the forties, followed by five days with the temperature in the low twenties or below, two days of which it snowed. Then, on Saturday and Sunday, we had high winds, coming from the east. The result – an ice-filled Lake Michigan with whitecaps and moderate waves, crashing over the embankment, icing over anything in its path. In this case, that meant lower branches on trees; the front sides, but not the back sides of trees; ice covered stones and metal creating unique sculpture-like structures; and winter bushes and grass with individual fronds and blades iced over. 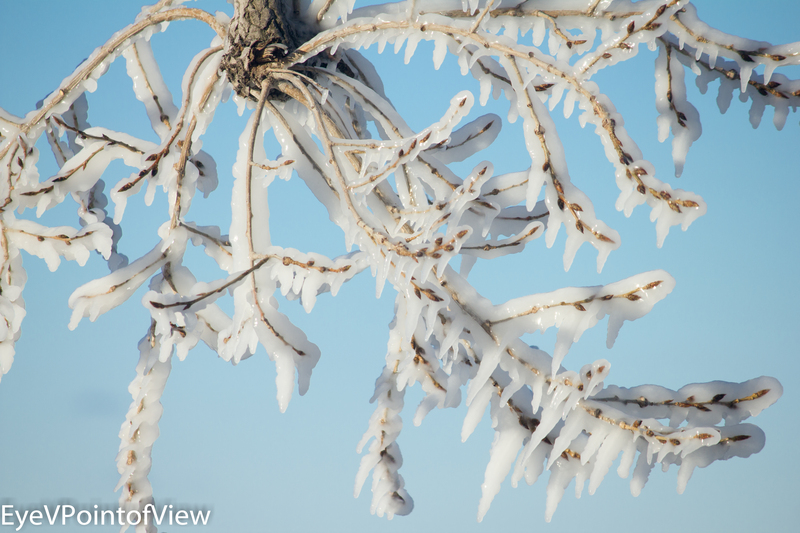 Up Close #1 – These iced over tree branches show the direction of the wind by the direction of the hanging icicles. The twigs are bare on one side, with the other covered by a thick coating of ice, making a nice contract against the clear blue sky. 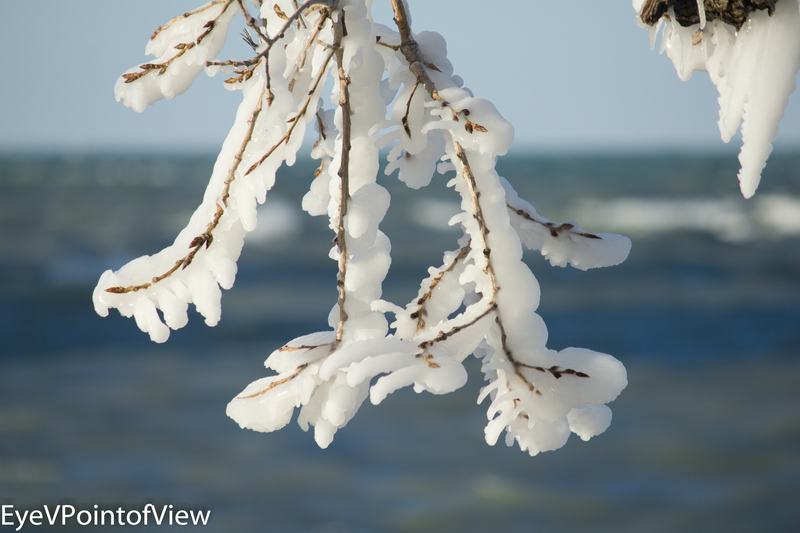 Up Close #2 – Lake Michigan whitecaps provide a colorful backdrop to these iced over twigs. 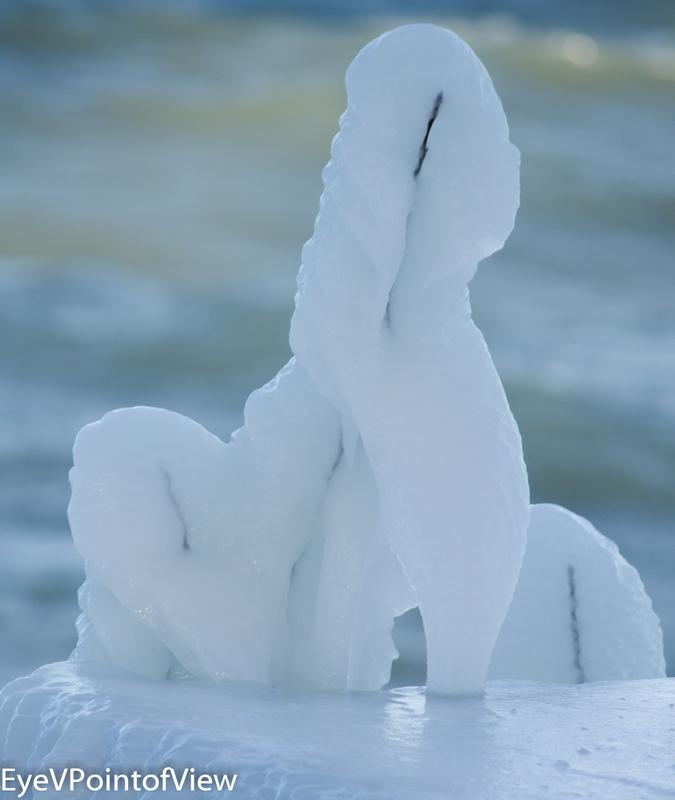 Sculpture – Always amazing to me when the result of a windstorm looks like a white sculpture that I would place in one of my hallways. This one was even on a stand! I love the light of the sun on the lake in the background. 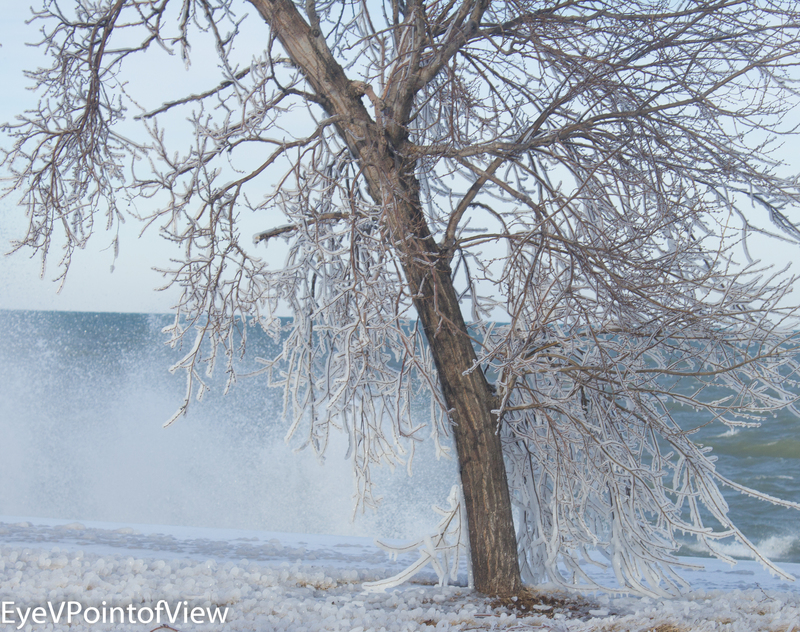 Icing Over – This image captures the lake crashing against the breakfront, with water droplets spraying the front of the tree, and the ground. So while all the other images in this set show the finished result, this one is clearly still in process. 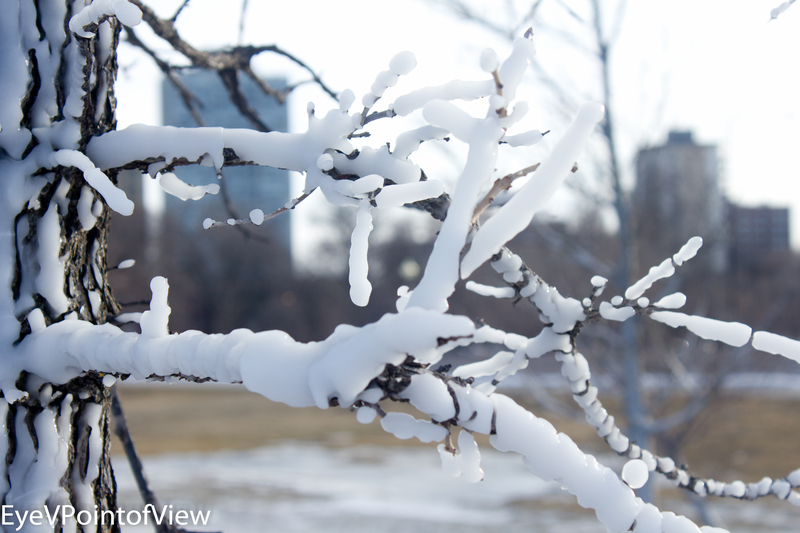 The back of the tree is bare, and the lower branches are individually iced over, and if you look closely, individual blades of grass are covered and frozen. While winter, in all its glory, won’t be over soon enough for most of us, it continues to surprise us with such iced over beauty.